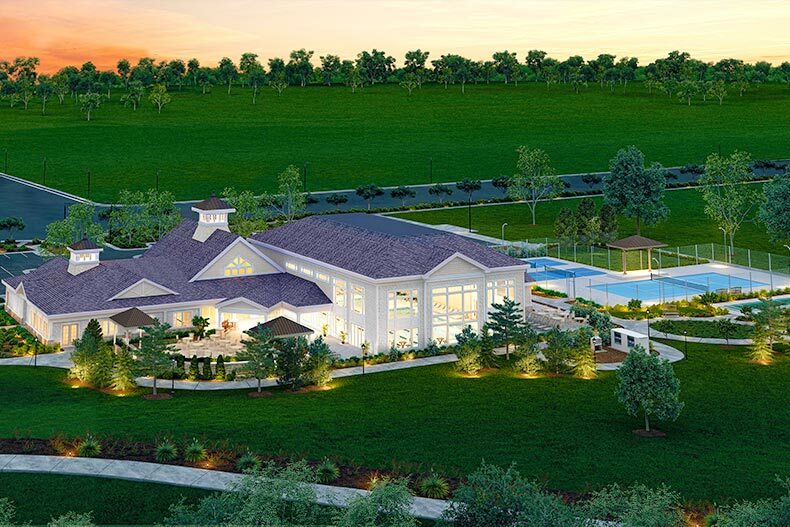 A 20,000 square-foot amenity center is planned as the centerpiece for Del Webb Carolina Gardens. Big news for fans of Del Webb communities in North Carolina as the 55+ community arm of PulteGroup officially announced its plans for Del Webb Carolina Gardens in the town of Fuquay-Varina. Del Webb Carolina Gardens plans call for 800 single-family ranch homes spread across 400 acres in Southwest Wake County. The builder plans to offer 10 different home designs in the community, all of which feature the latest technologies and designs that 55+ buyers have expressed interest in. Ultimately, concerns about safety, comfort, and livability will be at the forefront of home designs. Del Webb did not specify pricing but did tell 55places.com that they intend to release that information in mid-to-late 2019. The community is expected to open for sales in the summer of 2020. The developer says they intend to make Carolina Gardens a community where the focus is the active lifestyle and they intend for a 20,000 square-foot amenity center to be the centerpiece of that. Some of the planned features inside include a fitness room, fitness studios, an indoor pool, lifestyle spaces, and craft rooms. Outside, the expected amenities continue with an outdoor pool and sundeck, dog park, party plaza, event lawn, community garden, and pocket parks. Sports-minded residents will be able to get a game going at the community's pickleball, tennis, and bocce courts. Del Webb also intends for the community to hire a lifestyle director who will plan activities, organize clubs, and keep residents happy with plenty of things to do. Fuquay-Varina is located in the southern edge of what is commonly referred to as The Research Triangle, or commonly as The Triangle, a North Carolina area anchored by Raleigh, Durham, and Chapel Hill. While the name was created in reference to the major research universities located within those three cities (UNC, Duke, NC State), it's come to represent a thriving section of the state full of many attractions and exciting places to visit. Fuquay-Varina also gives residents convenient access to everyday shopping needs, as well as close proximity to key transportation corridors including I-540, US-401, and the future 540 extension. It's also just a 25-minute drive to Raleigh and a 40-minute drive to Durham. Del Webb is no stranger to The Triangle as Carolina Gardens is actually their fourth 55+ community in the region. It will eventually join Carolina Preserve in Cary, Carolina Arbors in Durham, and Del Webb at Traditions in Wake Forest. Those intrigued by Carolina Gardens might want to take a look at all three in the meantime, not only to get an early look at what this new Del Webb community might have to offer but also to find out if what they're looking for already exists (and is for sale). 55places.com will be sure to include updates about Carolina Gardens as soon as have them. In the meantime, make sure you sign up for our newsletter so you'll be the first to know when new information is released. Also, if you sign up for a User Account, you can save the community and receive email updates when new developments happen.